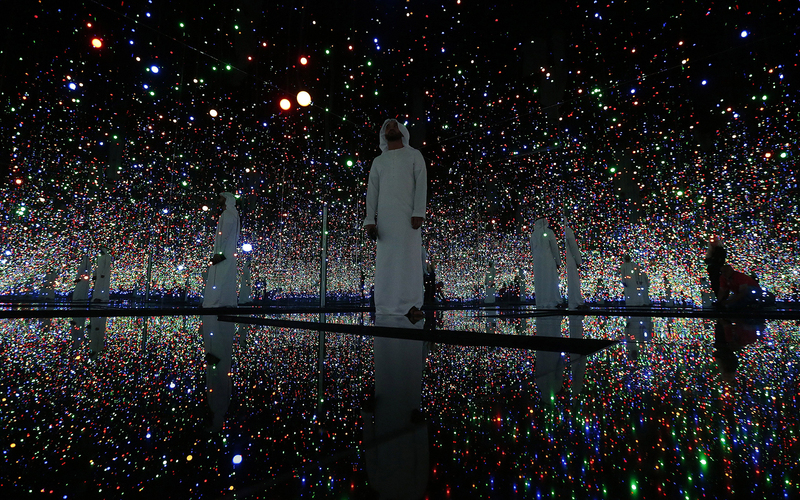 Visitors check out one of Yayoi Kusama's infinity rooms at a 2014 exhibition on Saadiyat Island introducing the collection of the future Guggenheim Abu Dhabi. The wealthy emirate is looking to burnish its image with a new mixed-use development that will include Arabian outposts of several world-class museums, including the soon-to-open Louvre Abu Dhabi, designed by Jean Nouvel. But once this cultural Xanadu is complete, will anyone come to look at the art? In Abu Dhabi, one of the seven Arab emirates, an enormous white dome of geometric skylights sits beside the turquoise waters of the Persian Gulf, like a flying saucer that has landed on a lunar landscape. The building was designed by Pritzker Prize winner Jean Nouvel, who says he took inspiration for the startlingly alien form from the qubba, one of Islamic architecture’s signature forms, and the interwoven palm fronds native to the Arabian Peninsula. This is the soon-to-open Louvre Abu Dhabi, whose tranquil setting belies the controversy that has roiled the billion-dollar project for much of the last decade. Originally slated to open in 2012, it is now supposed to open late this year, though the Tourism Development and Investment Company (TDIC), the emirate agency which is overseeing the project, has refused to confirm an opening date. Whenever it does open, it will become the first new museum outside France to bear the name of the venerable Paris institution, and the first universal art museum in the Arab world. Its showpieces will include some of the most iconic paintings from French national collections, displayed in an arid location where temperatures soar above 120 degrees Fahrenheit in the summer and remain in the 90s through late autumn, as they were on the November day I visited. The Louvre Abu Dhabi will be a cornerstone of Saadiyat Island (Saadiyat is Arabic for “happiness”), a $27 billion mixed-use cultural district that is rising a short drive from downtown Abu Dhabi. The project represents an effort by the sheikhs who control the emirate to invest in culture, tourism, and education as a means of helping the emirate’s economy survive once its petroleum resources dry up. Before the discovery of oil in the late 1950s, Abu Dhabi was a bedouin village dominated by the pearl trade. Now it has one of the world’s highest per capita incomes and a surreally improbable skyline. It includes one of the world’s most expensive hotels—the Emirates Palace—yacht-clogged marinas, a Formula One racetrack, and Ferrari World, which is listed by Guinness World Records as the largest indoor theme park on the globe. Saadiyat Island will be a new face for Abu Dhabi: a hub at the crossroads of Asia, Africa, and Europe grouping top-flight museums, educational institutions, resorts, and luxury residences. The supremely lavish development is slated to include 8,000 villas, 38,000 apartments, and 29 hotels. Some 150,000 people will live there. Five-star St. Regis and Park Hyatt resorts have already begun operating on the island, as has a New York University campus attended by students from 113 countries. If all goes according to plan, three additional museums and a performing arts center, all designed by Pritzker Prize winners as well, will follow the Louvre. As I walked around Saadiyat Island, I spotted a delicately curved steel form resembling a falcon’s wing jutting skyward through the hazy heat. This was a trial model by Norman Foster for the Zayed National Museum, for which the British Museum is a consulting partner. On another nearby plot, the Guggenheim Abu Dhabi, designed by Frank Gehry, is supposed to rise soon, though like the Louvre, it has been repeatedly delayed. But Saadiyat Island has been assailed by human rights groups for numerous documented abuses of the migrant workers contracted to erect this desert paradise. The Louvre in particular has drawn criticism from a coalition of artists, writers and activists, who see it as a sellout by the French government to a deep-pocketed, illiberal regime seeking to use art to polish its image. Many French disdainfully refer to it as Le Louvre des sables—the Louvre of the sands. In fact, the museum is not a satellite entity, but an independent, Abu Dhabi-run operation. The emirate paid the French government $1 billion for use of the Louvre name, expertise, and artworks, an agreement that will expire in 2037. I reached this would-be Xanadu via a 20-minute taxi ride from downtown Abu Dhabi, with its torqued towers sheathed in iridescent glass, driving across the Sheikh Khalifa Bridge, which is crowned by a looming portrait of Abu Dhabi’s current emir. The cab let me out at Manarat al-Saadiyat, a sprawling visitors center with scale models of the Louvre and the other museums, along with an audiovisual presentation that featured throbbing oud music and touted the “vision of our leaders.” A public relations consultant for Abu Dhabi’s Tourism Development & Investment Company took me to see the gaping entrance of a 40-foot-wide concrete-lined tunnel nearby that will link the Louvre, the Guggenheim, and the Zayed. It will facilitate secure, climate-controlled deliveries of art. 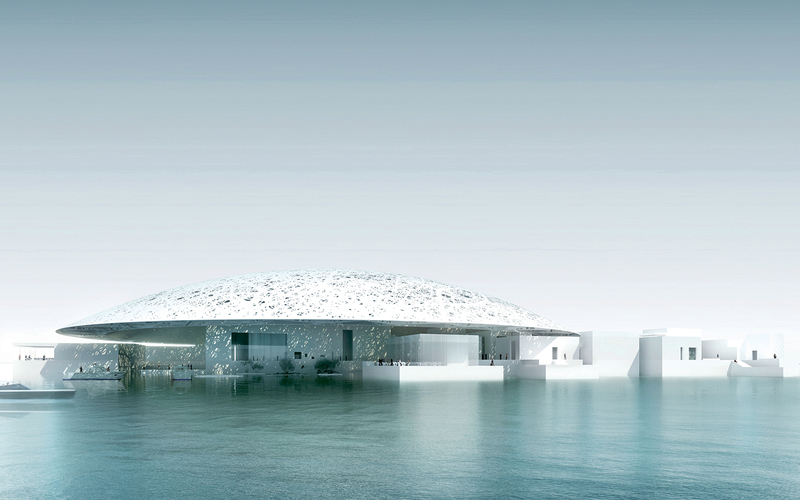 A rendering of the Louvre Abu Dhabi, which was inspired in part by traditional Islamic architecture. Abu Dhabi has acquired its own collection of some 500 artworks. They include a Paleolithic tool, an ancient Egyptian funerary monument, a Gilbert Stuart portrait of George Washington, and paintings by Paul Gauguin, Pablo Picasso and Cy Twombly. During the first ten years of its operation, the Louvre and other French museums, including the Centre Pompidou, the Musée d’Orsay, the Musée Rodin and the Bibliothèque Nationale, will also loan (critics say a more accurate term would be rent, since the French have been amply paid) 300 works. They include Leonardo da Vinci’s La Belle Ferronnière, Titian’s Woman with a Mirror, Napoleon Crossing the Alps by Jacques-Louis David, Whistler’s portrait of his mother, and Manet’s The Fife Player. Andrew Ross, a professor of social and cultural analysis at NYU—who was barred from entering the United Arab Emirates last year because of his research into the treatment of laborers there—argues that such displays are mere “sweeteners” for the real estate development. The real purpose of these amenities, he believes, is to give an enlightened veneer to an authoritarian nation. Ross and likeminded critics have staged protests at the Guggenheim’s flagship museum in New York City and at the Peggy Guggenheim Collection in Venice to focus attention on exploitation of workers on Saadiyat Island and in the UAE more broadly. The TDIC confirmed that a Pakistani worker died on the Louvre site last June. A 2013 investigation by the Guardian found that workers had to pay steep recruitment fees to get their jobs, few were paid their promised wage, and some lived in miserable conditions. 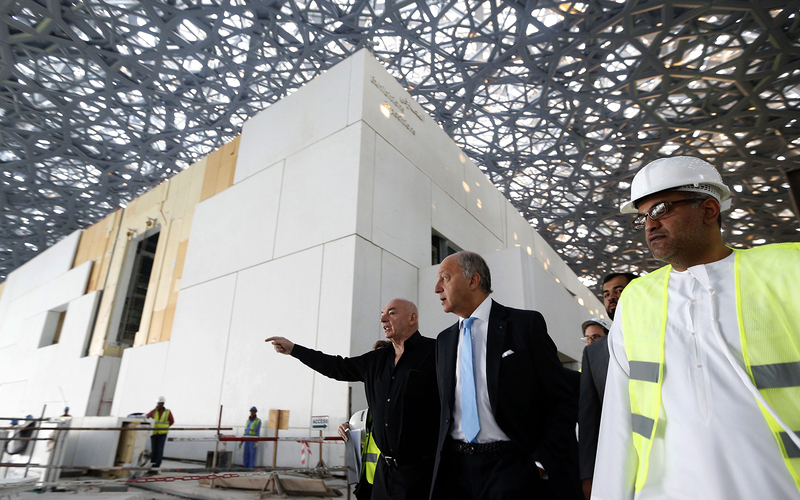 Architect Jean Nouvel leads French Foreign Minister Laurent Fabius on a tour of the Louvre Abu Dhabi in January 2016. Under this spotlight, Frank Gehry hired a human rights attorney to advise him on how best to safeguard the welfare of workers on his Guggenheim. The building they are responsible for erecting will be 12 times larger than the original Guggenheim. It will consist of cone-like structures of titanium, blue glass, and stone forming a tumbling, asymmetrical mountain, a design that Paul Goldberger, the architecture critic and Gehry’s biographer, called “perhaps too grandiose.” Its complexity, combined with the outcry over labor conditions, has likely figured behind the lags in its construction. But while the museums have all been delayed, the year-old NYU campus is fully operational. After visiting the Louvre construction site, I took a five-minute drive to the compound, which stands solitary and encircled by beige dunes. It was designed by yet another name-brand architect, Rafael Viñoly, as an amlagam of an Islamic neighborhood and Greenwich Village. It has palm-studded courtyards, pergola-shaded walkways with water flowing through channels dug alongside, and signage in English and Arabic. Compared to the island’s futurist museum designs, it feels sober and restrained. 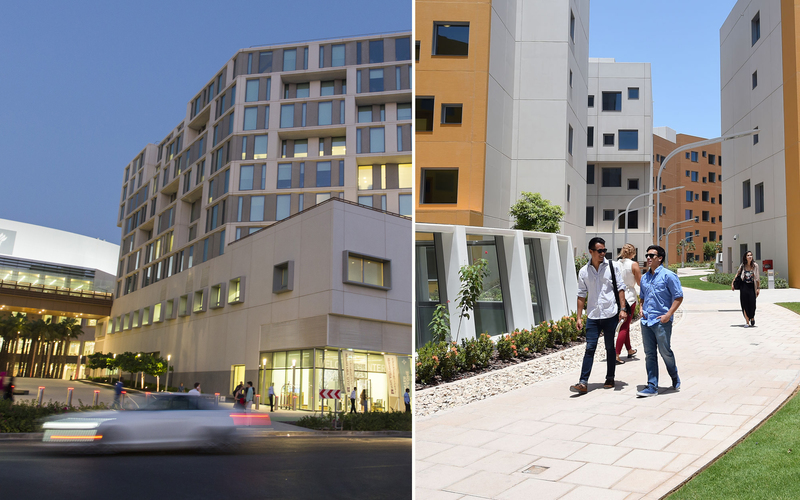 NYU has faced its own challenges on Saadiyat. Following a New York Times report in 2014, the university commissioned an audit that found that a third of the workers who built the campus had been exempt from the university’s project guidelines regarding fair wages, hours, and living conditions. 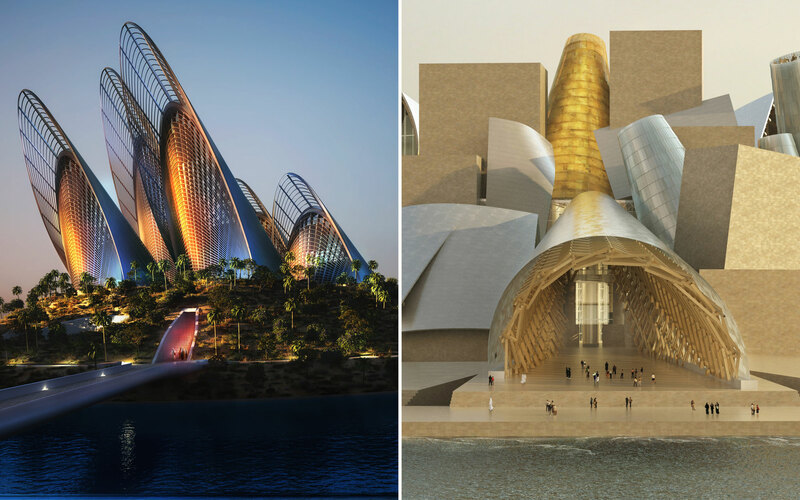 Renderings of the future Zayed National Museum (left), by Norman Foster, and the Guggenheim Abu Dhabi, by Frank Gehry. In the “Best-Sellers” section of the campus bookstore, I found the Koran next to Hillary Clinton’s Hard Choices. Twelve percent of the nearly 900 students enrolled there are Emiratis, with nearly as many coming from the United States. The students I spoke with were well aware that they had signed up for a different experience than their NYU counterparts in Manhattan. “I like it that you have to respect their culture,” said Tomasz Bachosz, a 19-year-old freshman from Poland. He added that he and his classmates were careful to adhere to local customs and dress modestly when off campus, not to criticize the Emirati government, and to avoid showing physical affection between sexes. Even so, he spoke of a “huge LGBT community” on campus, even though homosexuality is a crime in the UAE. Enlivening the free zone spirit is an up-to-the minute three-theater performing arts center where acts like the Kronos Quartet and folk and blues musician Toshi Reagon have performed. “We’re bringing a lot of work that is unprecedented in the region,” said artistic director Bill Bragin, who spent seven years at New York’s Lincoln Center as director of public programming. “We’re still figuring out who the audiences are and who they could be.” When Reagon appeared in September, Bragin arranged for women-only shows to encourage young Emirati females to attend. “I’m creating a place where people can take a chance and encounter things for the first time,” he said. When pressed, he conceded he wouldn’t be staging works with gay themes or anything relating to Jews or Israel. “You want to be sensitive to where you are and to figure out what you can do what you can’t do.” Bragin, who receives all of his financial support from the Abu Dhabi government, declined to reveal his budget. Scenes from NYU's Abu Dhabi campus on Saadiyat Island. Nusseibeh acknowledged that Abu Dhabi had no tradition of museum going, but insisted that locals would join foreigners at the new Louvre. “We have to start public education campaigns both to bring foot traffic to the museums,” he said, “and to make the public more aware of art and culture and its place in society.” Still, when I visited the Sharjah Art Museum, in another of the emirates, I walked virtually alone through an exhibit of the drawings of Khalil Gibran. Perhaps works like Whistler’s Mother and Manet’s The Fife Player might draw more art lovers into air-conditioned galleries of the desert Louvre, but it remains to be seen whether Saadiyat Island can become a true international cultural hub or nothing more than a costly mirage.